Last but not least at the MRCY Block party was beloved Canadian indie-rock band Metric. Dressed entirely in black, grey and white, the foursome took to the stage amidst a lightshow worthy of a headlining band, with blindingly bright strobes and multicolored beams shooting out into the crowd of stunned attendees. 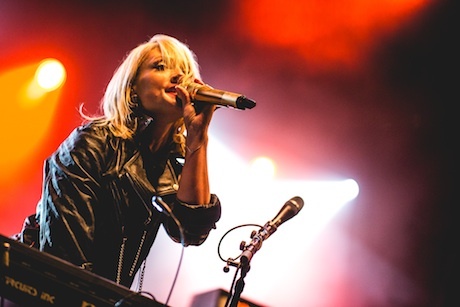 While the entire band was undeniably on point, what with the guitar, drums, and bass creating intricate, layered harmonies, it was clear that lead singer Emily Haines was off. Known for always hitting the right note in each of their songs, Haines seemed off-key for most of the set, resulting in a somewhat disjointed performance. While she danced around the stage as per usual to get the crowd going, she didn't seem quite like the frenetic Emily Haines we all know and love. While the show was nonetheless good, the energy that makes Metric who they are was not there, resulting in a somewhat disappointing performance.